The national memorial dedicated to Franklin Delano Roosevelt, the 32nd president of the United States, lies about half way between the Lincoln Memorial and the Thomas Jefferson Memorial in Washington, DC. Its four open-air rooms represent each of the four terms of office to which he was elected. A meandering pathway leads past waterfalls, bronze sculptures, and FDR’s own powerful words carved on the granite walls. The memorial honors the memory of one of America’s great leaders and the optimism and courage that he shared with his fellow citizens through the ordeals of the Great Depression and World War II. A statue of Roosevelt sitting in a wheelchair greets visitors and reminds them of the man who refused to let disability stop him. When Congress established the Franklin Delano Roosevelt Memorial Commission in 1955, there was already a modest memorial to Roosevelt in Washington, DC. Roosevelt told his friend Felix Frankfurter what he wanted: “a block about the size of [this desk] . . . in the center of that green plot in front of the Archives Building.” The new, larger memorial took over 40 years of planning before its dedication on May 2, 1997. 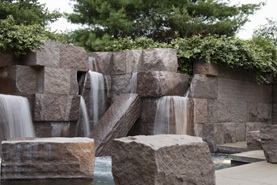 The FDR Memorial Commission selected landscape architect Lawrence Halprin to design the memorial in 1974. The result, with its shade trees, waterfalls, and quiet alcoves, feels more like a secluded garden than a traditional memorial. Walls of red South Dakota granite define the memorial’s outdoor rooms and the passageways connecting them. Waterfalls, quiet pools of water, and Roosevelt’s own words, beautifully incised into the granite walls by master carver John Benson, create a mood of quiet reflection. Each room conveys in its own way the spirit of the man. In Room One, a bronze bas-relief of the first inauguration, one of the early public sculptures created by Robert Graham, introduces the first years of Roosevelt’s presidency, when he launched the New Deal in response to the worst economic crisis the nation had ever known. 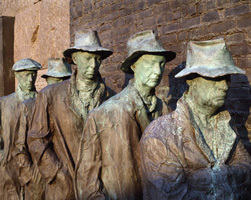 George Segal created the powerful sculptures in Room Two. The Breadline represents the despair of the Great Depression. The Fireside Chat depicts the hope that Roosevelt’s inspiring words gave to ordinary people. "We have faith that future generations will know that here, in the middle of the twentieth century, there came a time when men of good will found a way to unite, and produce, and fight to destroy the forces of ignorance, and intolerance, and slavery, and war." The centerpiece of Room Four is a monumental bas-relief created by sculptor Leonard Baskin. The Funeral Cortege represents the nation in mourning after the death of the only president many of them could remember. Neil Estern’s statue of Eleanor Roosevelt honors her contributions as first lady and as one of the early delegates representing the United States at the newly formed United Nations. 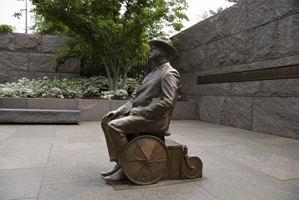 One of the things visitors to the Franklin Delano Roosevelt Memorial see is a simple, but powerful, statue of FDR sitting in the kind of wheelchair he used after the polio attack that paralyzed his legs in 1921. Halprin carefully designed the FDR Memorial to be accessible for people with all kinds of disabilities, but the original plans did not include this sculpture. Spokespersons for the disabled protested, arguing that showing the truth of FDR’s paralysis, something that he himself rarely allowed, would increase awareness and set an inspiring example for others who struggled with disability. Congress agreed. Robert Graham created the present statue, dedicated in January 2001. The Franklin Delano Roosevelt Memorial National Memorial, a unit of the National Park System, is located in West Potomac Park between the Tidal Basin and the Potomac River in Washington, DC. The Memorial is open 24 hours a day. Rangers are on duty to answer questions from 9:30am to 11:30pm daily, except for Christmas Day. The closest Metro stop is Smithsonian. For more information and a map locating the memorial, visit the National Park Service Franklin Delano Roosevelt Memorial website or call 202-426-6841. Visit the National Park Service Virtual Museum Exhibit on Franklin Delano Roosevelt.